Jammed into the roof crack, my hands and toes were all that kept me off the ground as I caught a glimpse of the desert tortoise below. I could smell the fresh scent of dryer sheets and hear the hum of the dehumidifier. Did I mention I was in my friend Roland’s basement? Our lazy mascot, Allie, a sulcata tortoise, is native to the Sahara Desert and distinct from the Sonoran tortoises of America’s Southwest. She sure does the trick, though, to spur the imagination of an Ohio college kid set on climbing the splitters of Indian Creek during spring break. 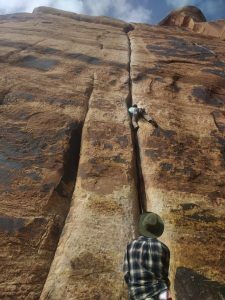 Known for its perfect splitter cracks that ascend the sandstone buttes just south of Moab, Utah, the Creek is the ultimate crack climbing destination in the US. However, training for a trip there is not easy. 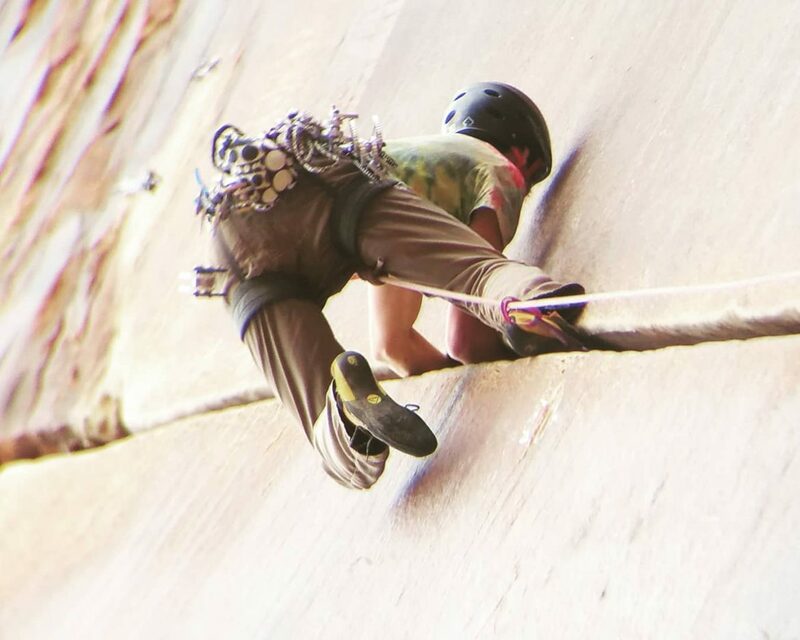 Its unique features that draw climbers from around the world are poorly replicated at local gyms, and are hardly found at any crags near the Midwest. 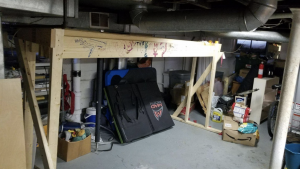 So, inspired by the WideBoyz (Brits Pete Whittaker and Tom Randall, who famously transformed their basement into an off-width training dreamland), we decided to build our own crack board to practice on. Roland and Allie hanging out. 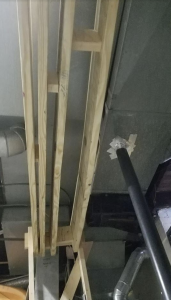 Despite using a tried and true design that a friend of ours had already set up in her apartment, I half expected the structure to collapse the first time I got on it. The rickety result of a day of tinkering in Roland’s basement was not pretty, but proved to be structurally sound. The basic design consists of three pieces: two supports and the ten-foot crack board that rests across the supports. There’s lots of room for customization on the crack board. Ours includes three sections: off-width, hands, and fingers. We still haven’t found anyone who can traverse the finger section. Making the most of our limited space in the basement, we tapered the hand crack width to range from tight hands to fists. No matter where you live, practicing on a crack board is a good way to develop your skills as a climber. It’s far from perfect, however. Unlike rock, which is likely to cut your hands, wood tears at your skin and can be more painful…well, differently painful. You’ll find that tape gloves are just as necessary while training as when you’re climbing outside. Another drawback to our set-up is that, unlike rock, wood will subtly flex under pressure. This isn’t the end of the world, but it is not ideal when your bomber hand jam begins to slip and the other end of the crack starts to pinch on your already cramped toes. You can prevent the majority of flexing by fixing wooden braces along the inside of the crack (as shown in the picture). A view from the underside of the crack board. To begin training on your crack board, start by heel-hooking your way across. This allows you to take most of your weight off your hands and figure out the way you feel most comfortable jamming. Be sure to practice different jamming techniques including thumbs down, thumbs up, and shuffling (where your thumbs face each other and your hands never cross). Each of these will be useful in different situations. As you grow more confident, begin transitioning to foot jams until you can traverse all ten feet without falling. Once you’re at this point, begin doing laps. Try to cross the crackboard hands first, then go back the other way feet first. In addition, practice turning around so that you can go hands first in both directions. Doing laps until you slip out is the best way to train your endurance. This progression certainly worked for me. 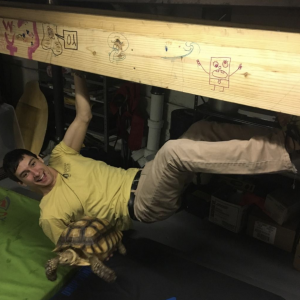 With a few weeks of training, and lots of motivation from Allie the tortoise, I got the hang of jamming my way across the roof. I developed from hardly being able to carry my weight to easily doing laps on the makeshift crack. Roland and I also practiced placing protection, dropping feet, and trying out hand and foot jams of different styles. Spring break finally came and it was time to discover how well our training had payed off. Thirty some hours and only one car break-down later, we rolled up to the Bridger Jack campground in Indian Creek with just enough time to set up camp before the sun illuminated the backdrop of sandstone towers. The next few days were spent at the crags by our campsite. It turned out that our training really did pay off. While we never expected to be crushing the hardest routes in the area, we were prepared to climb some of the most classic lines like Supercrack of the Desert (5.10). As anticipated, the transition from the horizontal crack board to vertical splitters came as a blessing. With gravity working on our side, Roland and I found that hand jamming was less tiring and foot jamming less painful. Additionally, the vertical orientation made it easier to find rests by relying on solid feet to hold most of our weight. With that said, the climbing was far from easy. The sheer distance of sustained jamming was exhausting, even after having practiced doing laps on our crack at home. Another frustration was the energy demand of placing pro. While in motion, I generally felt comfortable, but when it came time to place gear, I would lose energy holding myself in place. I recommend practicing lock-offs and dead hangs to address this issue. Climbing in the Creek was humbling and an absolute blast. Still, the true test of our training took place closer to Moab, at an area called Crackhouse. With its system of roof cracks zigzagging through a low cave, Crackhouse is the perfect crag for honing your skills. Its namesake route, “The Crackhouse” is a V8 boulder problem first climbed by Dean Potter. No, we did not traverse all its 85 feet of painful jamming–not even close. We did, however, try our luck on sections of it, and because of our training, managed to have some fun. The Crackhouse sent us the message that we’ve made a good start, but still have lots of work ahead of us. In the end, the best way to train for crack climbing is crack climbing. To some day send The Crackhouse or any number of the insane splitters at the Creek, it’s going to take a firm commitment to getting outside and climbing on real rock. For the time being, with the crack board in the basement and the assurance that Allie will be there cheering Roland and me on for at least a hundred more years, I’ve taught myself that I can grow as a desert climber, even in Ohio. Planning your own trip to Indian Creek? Don’t forget to pack these essentials!